CaseCruzer knows its sturdy and reliable Shooting Range Universal 3 Pack Handgun Case will hit the mark with target practice fans. Its design is ideal for civilians and professionals who believe 3's a charm when traveling with favorite pistols. And the unique lock-down security system reinforces the company promise, "We keep your treasures safe!" Shooting Range Quick Draw Handgun Case designers developed three snug, tilted saddles that provide swift, smooth removal of pistols during practice sessions and contests. The carrying case also stores up to 18 magazines and provides an accessories compartment for glasses and other necessities. A perfect fit for private citizens and law enforcement personnel. 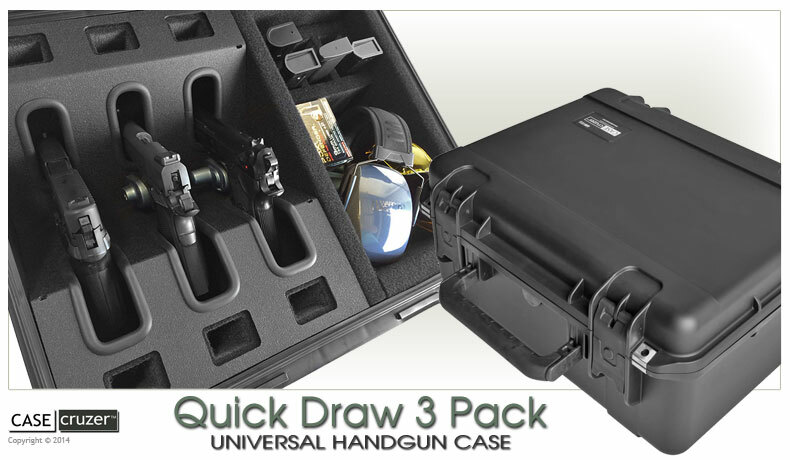 Universal 3 Pack Shooting Range Handgun Case users enjoy peace of mind when traveling due to field-tested safety features. Trigger latches and stainless steel flanges allow sportsmen and women to padlock their treasures while traveling. And parents who store firearms at home are assured that children and other unauthorized users will never gain access. "Convenience and safety will always be a major part of our promise to consumers. The right to bear arms comes with responsibilities that everyone here at CaseCruzer takes very seriously," says Tatiana Briceno, marketing director. "We also love innovating so that handgun fans have exactly the type of gun case they need for target practice and storage." Shooting Range 3 Pack Universal Handgun Case target practice enthusiasts often remark that toting three favorite handguns provides plenty of variety when shooting. Also, cleaning triplets is easier than servicing a large assortment of firearms after a fun day on the range. Shooting Range Quick Draw 3 Pack Handgun Case dimensions fit semi-automatics up to 9.25" in length and revolvers with barrel lengths of 4" or less. The reusable shipping transport solution embraces major brands, such as Auto-Ordnance, Beretta, Colt, FNH, FNS, Glock, HK, Remington, Ruger, Sig Sauer, Smith & Wesson, Springfield Armory, Steyr, and Walther. The 3 Pack Universal Shooting Range Handgun Case exterior dimensions are a trim 20.25"L x 16.93"W x 8.78"H. Easy to lift with two rubber over-molded fold-down handles, and weighs only 11.20 Lbs when empty. The handgun transport will not corrode because it is water, air and dustproof due to an ambient pressure equalization valve, high-quality latches, and o-ring seal. The sleek shockproof hard-shell exterior — available in black only — is impervious to forcible impact and vibrations. Must be checked in at airports, is ATA 300 rated, and travels with a lifetime warranty. Universal Shooting Range 3 Pack Handgun Case manufacturer CaseCruzer is dedicated to creating "green" reusable shipping and transport solutions civilians and law enforcement professionals. "We keep your treasures safe!" Within the weapons market, CaseCruzer offers a wide array of pistol and rifle case solutions to meet the needs of Law Enforcement, Military, and Civilian gun enthusiasts. For more information on the new gun case, please visit www.casecruzer.com; call 800-440-9925 in the U.S. or 909-613-1999 internationally; fax 909-465-5598; or write to CaseCruzer at 4665 State Street, Montclair, CA 91763.